Generally when one thinks of monkeys and their environment, one imagines tropical jungles, not snowy hills. 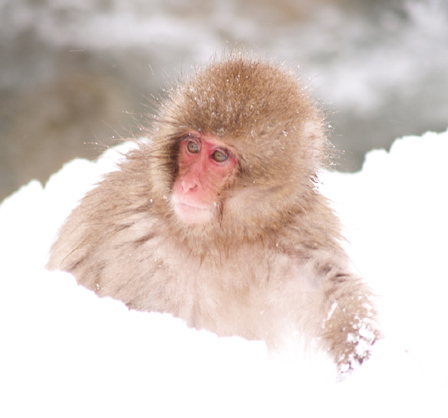 This is what makes the native Japanese monkey, the macaque or “snow monkey,” so unique. The Japanese macaque is the only species of monkey that lives as far north as it does. Macaques can be found in several places in Japan in environments raging from subtropical to sub-alpine. 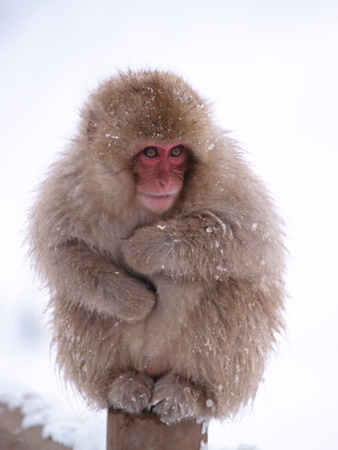 The northernmost group of Japanese macaque grow thick furry coats in winter. In the 1970s Life magazine first featured the Japanese macaque monkey enjoying a wintry dip in a hot springs near Nagano. Thus was born the international fame of the so-called “snow monkeys” of Japan. With their thick fur coats, almost human-like faces, and their deep, soulful eyes, the snow monkeys quickly won the hearts of people worldwide. Macaques grow to 79 to 95 cm (2 to 4 feet) and weigh 10 to 14 kg (20 to 60 pounds). The males are generally larger than the females, but females outnumber the males in their social groups. Macaques live about 30 years and reach adulthood around 3 or 5. 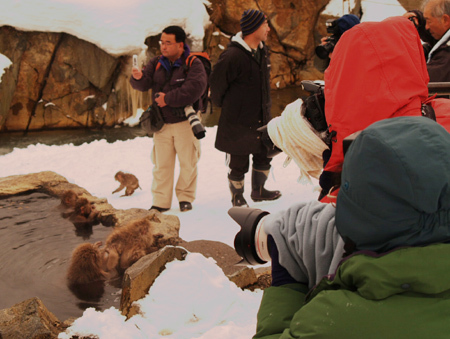 Although the snow monkeys possess such wonderful and thoughtful eyes, visitors should NOT stare directly into them. Staring is seen as an act of an aggression and a visitor looking to commune with the spirits of nature may suddenly find their nose communing with the sharp teeth of an enraged snow monkey. Macaque groups, called troops, have a strict hierarchy. An older male monkey with several male helpers rules a troop, deciding on where and when to migrate, as well as providing protection from other troops. Troops are composed of males and females of various ranks. Males will move from troop to troop, but females will stay in their troop their whole life. Female rank is very important, as their babies will retain the hierarchical rank of their mother. Troops leaders have sometimes received their status due primarily to the position of their mother within the troop. Macaques are known to transmit acquired knowledge to each other. Scientists observed a female macaque washing a sweet potato before eating it. She was the first one to be observed doing this behavior. Soon after, the rest of her troop began washing their sweet potatoes before eating them. This behavior then apparently spread rapidly through all macaque groups in Japan. This phenomenon led to the Hundredth Monkey Meme that after a certain number of monkeys learn new behavior this behavior somehow will spread throughout monkey-kind. It was also believed this that theory explains how ideas are spread in human societies. The theory, though discredited, persists, particularly among New Agers. 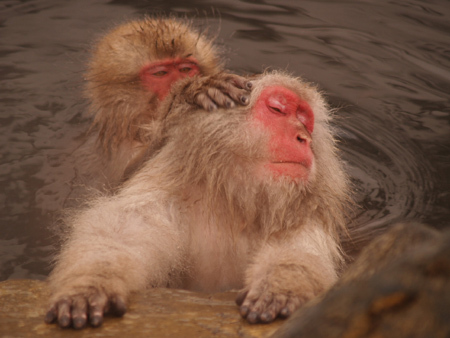 Monkeys hold a special place in Japanese religion and folklore. 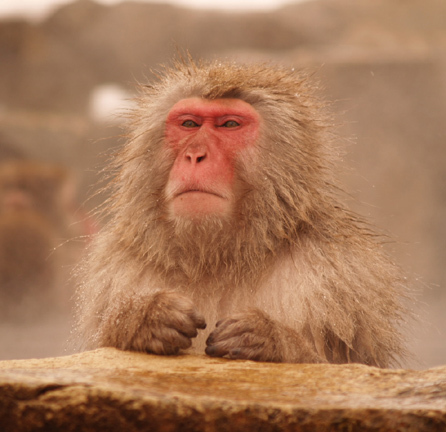 In native Shintoism monkeys are seen as the messengers of river and certain mountain gods. With the influx of Buddhism and Chinese culture, in which monkeys also had an important place, monkeys flourished, and their legends spead accordingly. Monkeys became demon-quellers and the protective spirits for childbirth and for warding off evil. The famous “hear, speak, and see no evil” monkeys are believed to have originated at the Tendai Shinto Buddhist complex on Mt. Hiei, north of Kyoto. 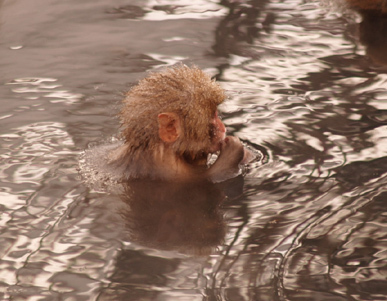 Japanese Monkey Tales often exalt the cleverness and resourcefulness of monkeys. One of the most popular stories about monkeys in Japan is the story of the monkey and the jellyfish. A long, long time ago the great Sea King’s wife was sick and for some reason the only thing that would cure her was a monkey’s liver. Since monkeys lived on land and fish is the sea, it seemed a hopeless task to procure one. However, one marine creature was the obvious choice for such a quest - the jellyfish. With its strong bones and hard shell, the jellyfish was well-suited to go onto the land and seek out a monkey. The jellyfish soon found a curious monkey to whom it impressed with its description of the Sea King’s Palace. The jellyfish offered the monkey passage to the wondrous realm of the Sea King upon its hard shell. The eager monkey agreed and off they went. Along the way, the monkey grew concerned about the nature of their conversation which seemed revolve around livers particularly his own. The jellyfish eventually went too far and let slip the purpose its visit. The monkey was naturally alarmed as anyone would be if they found themselves in the middle of the ocean on the back of a jellyfish’s shell and discovering that their liver was to be the guest of honor rather than themselves. But with cleverness being his birthright, the monkey hid his fear and began to lament. He told the jellyfish that in his haste to go to the Sea King’s Palace, he had unfortunately left his liver hanging in a tree which of course is what all monkeys do when they go climbing. The jellyfish not being the smartest of Scyphozoans believed him and rushed back to land with his liver-less monkey. When they reached land, the monkey leaped into the trees and instead of monkey liver, the gullible jellyfish received only monkey laughter. The Sea King was noticeably put out when he heard the quaking jellyfish’s report. He ordered the bones of the jellyfish to be removed and its shell to beaten to a pulp. And today the jellyfish and its descendants float about boneless and shell-less while giving monkeys a wide berth. 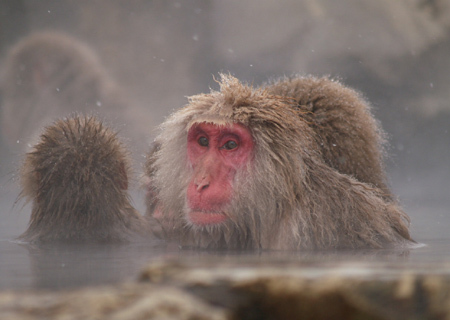 In areas like Nagano, where snowfall can reach record depths, the macaques seeking respite from the cold head for hot spring areas. 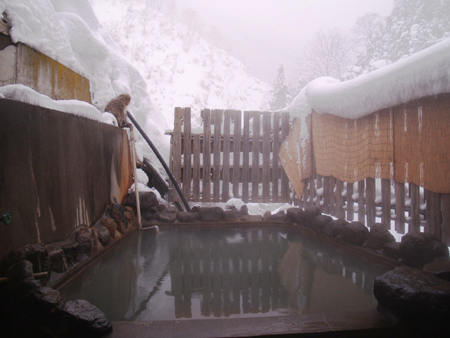 North of Nagano city is the hot spring area of Yudanaka, which is popular with humans and simians alike. In the early 1960s a female macaque arrived here and found the hot springs to her liking, and others soon followed. A park was later created in the area where monkeys and their distant cousins humans could mingle. 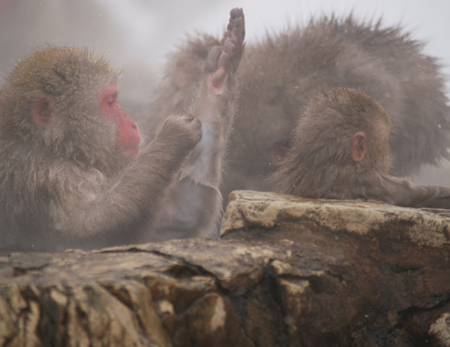 Although the Monkey Park goes by the ominous-sounding name “Hell’s Valley” (Jigokudani), the monkeys seem unperturbed by it as they play and bathe with reckless abandon. To them, Hell’s Valley is simply heaven. At the entrance to the park is a hot spring center for humans, where they can share a bath with monkeys if they so desire. There are two outdoor baths that adventurous monkeys will wander down to in order to observe the bathing rituals of humans. For those who might be put off by monkeys gawking at them, there are indoor baths as well. Getting to the monkeys requires a bit of time if one is not staying in Yudanaka itself. From Nagano City, take the Nagano Dentetsu train to Yudanaka. It takes about an hour or so. From Yudanaka station take a 15 minute bus ride to Kanbayashi Onsen. Go up the hill and follow the signs to the beginning of the trail. It’s a 30-minute walk along a narrow trail. 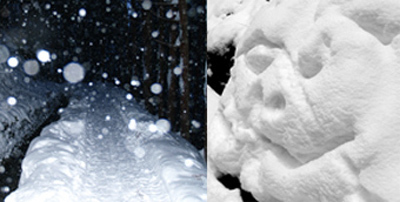 In winter, the trail is covered in snow so one must be careful of slipping and from falling patches of snow from evergreen branches. ohh, poor monkey. I really like the cold season, i usually like to play with the snow although i´m not a child anymore i remember my happy childhood and all the beutiful time that i spent with all my friends. Now when is snowing i prefer to spend my time with my boyfriend, most of all that he decided to buy viagra, we enjoy all the time.